I'm gonna pull out a tired old cliche here. Please do not judge a book by its cover. If you are a cover judger then you'll never pick up this novel because it looks like a fantasy novel comprised of amazon women and volcanoes. Thankfully this is not that kind of book. I honestly question why this image was used. I guess world of warcraft was giving away free stock images that day. I received this book as an advanced copy for review and knew immediately that I would hate it. I actually started reading the book for good material to slam it in a review. So imagine my suprise (imagine it, or else!) when I found it very easy to read and found it to be a very captivating story. To sum up the plot, Ariella is a Jewish slave to the Roman elite when she escapes to a gladiator training camp. She is able to hide her gender and ultimately fights as one of the smaller gladiator men. Think Joan of Arc meets Spartacus. Meanwhile a young honest politician, Cato, has recently arrived in Pompeii with his family and feels prompted to challenge a corrupt politician who rules the city. The third character is Mount Vesuvius and she (yes "she") interjects at the end of a few chapters spelling doom and gloom to come for everyone, good or bad. I found it tiring that Ariella kept getting away with being a gladiator. I've seen Spartacus on Starz and I know that they are always naked. But thankfully only the first third of the book keeps her in this ruse. I have mentioned the tv series Spartacus a few times, and the inner workings of dirty politics in this book and the arena battles could easily fit into a season of that show and that is not a bad thing. Higley has a talent for knowing just when to mix things up in the plot. Just when you think you're getting tired of a story angle, Higley mixes it up and creates a completely new and entertaining situation. And of course everything becomes mayhem with the inevitable volcano eruption. I haven't looked into Higley's bio to find out, but I gather she writes subtly Christian novels. I'm sure that works for her, but everytime that christianity is introduced in this book it feels forced. I actually could have done without it, and not had to deal with the instant conversions that take place in the book. Some things may have changed between the advance copy I read and the actual book that is on the shelf now, so I hope she made a few quick edits. Unfortunately the cover is still the same. 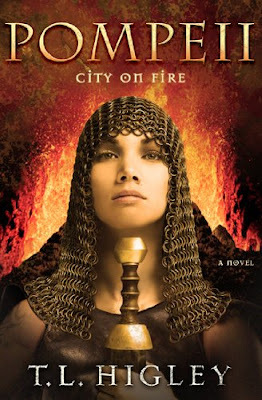 Pompeii: City on Fire, by T.L. Higley is 368 pages and gets a surprising yet deserving 4 stars.